Long gone—and good riddance—are offices with rows of cubicles or desks modeled after factory assembly lines. In fact, many employers today use office design as a statement of their firm’s ethos and even provide common areas for relaxing, free food, and toys to foster employees’ loyalty. Another new take on the traditional office is the common workplace—offices in which individuals and small businesses share space and costs. WeWork, an eight-year-old company, is taking the notion of the common office to a whole new level, and its goal is nothing short of transforming the way the world thinks about work. Headquartered in New York but with services across the globe, WeWork began as an agency that offered established businesses, startups, and freelancers workspaces designed to bring community to the office place. It initially attracted freelancers and tech start-ups with features such as aesthetic design, large common areas, free beer, and piped-in music chosen to appeal to millennial workers. In these spaces, businesses that typically have nothing to do with one another—a dance company and a hair care start-up, for example—work side by side. WeWork runs the spaces using economies of scale, saving renters money and allowing them to focus on their businesses.But the idea is starting to catch on with larger, more established corporations, which are moving into WeWork spaces, too. So far, The Weather Channel, GE, HSBC, and Microsoft are among those that have signed on, banking on the WeWork promise to cut operational costs by up to 50%. Cost cutting isn’t WeWork’s only goal, though. Its founder, Adam Neumann, has a vision to offer corporate customers a WeWork operated space that provides not just a communal office but the amenities humans need for everything they do except sleep—spa, gym, restaurants, and even a dry cleaner. The reason? So strangers can come together and perhaps be the balm that salves our fractious world… or at least make connections that can lead to more cross-venture interactions. The idea has detractors. Some paired organizations have vastly different work models and quibble like roommates. Business valuators claim the model cannot sustain itself. Still, there’s no denying that Neumann is onto something. The young company is currently valued at $20 billion. What are the advantages to sharing work space with a mix of different businesses for individuals? small companies? large organizations? What do you think about Neumann’s idealistic goal of using the workplace to help solve problems in our divisive world? 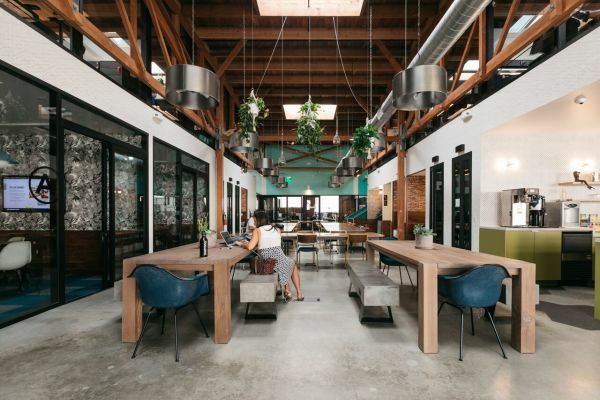 Which situations gave rise to this new model of shared office space? This entry was posted in 3. News You Can Use and tagged common work space, WeWork on July 31, 2018 by bizcombuzz.